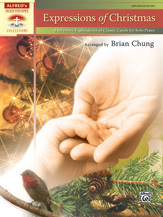 Expressions of Christmas is a musically imaginative collection of classic carols masterfully arranged by Brian Chung. The inventive arrangements, which vary from a harmonically rich setting of "Lo, How a Rose E’er Blooming" to a jolly ragtime version of "Jingle Bells," explore concert-worthy sonorities, textures, and rhythms. To assist in planning, approximate performance times are included. Titles: Away in a Manger * Gesù Bambino * How Great Our Joy * It Came Upon the Midnight Clear * Jingle Bells * Lo, How a Rose E’er Blooming * Silent Night * What Child Is This?